~ Connecting You To A World In Need. Rotary International (RI) has been a longtime friend of Heart to Heart. The two organizations share, if not the same, very similar goals centered around service. In fact, 20 years ago, it was a handful of Rotarians in the Kansas City area that set everything in motion, creating what is now known as Heart to Heart International. HHI Interim CEO Krystal Barr was on hand at the club’s annual shrimpfest/bingo night to accept the award in front of hundreds of attendees. 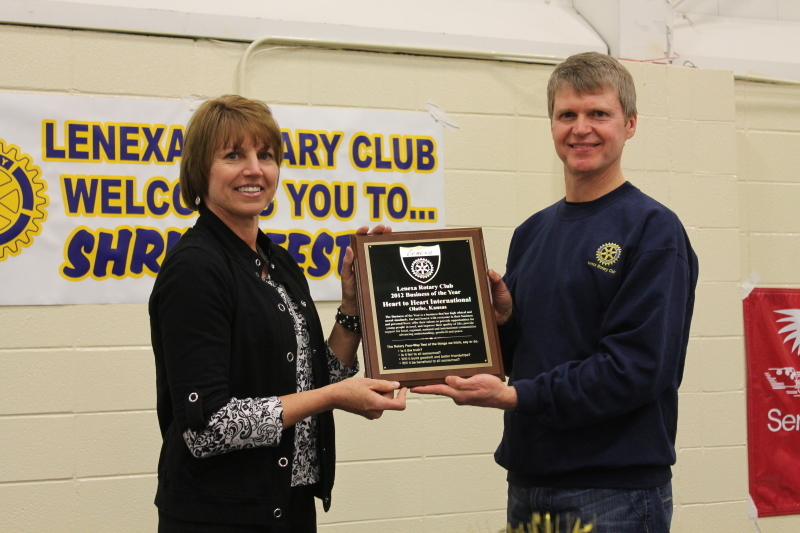 The shrimp was very tasty, the bingo a lot of fun… but it was the award that really stood out. To be recognized by such a group for all that we do to broaden access to healthcare in the US and around the world is quite an honor. Many thanks to Rotary for being there at the beginning, throughout Heart to Heart’s history and for the continuing goodwill and friendship. Third Annual 5K Trail Run for Haiti – Sign Up Now!